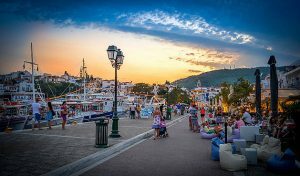 Wondering when the best time would be to start planning something along the lines of Skiathos holidays? Well, as far as planning a visit to wonderful Skiathos, one important factor to consider is the weather. 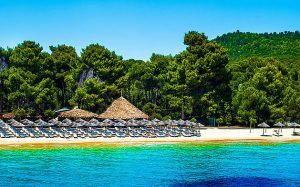 In this case, you will be most delighted in terms of Skiathos weather that offers something for everyone – as depending on your priorities, of course. You can be rest assured that whatever your specific traveling goals, wants or needs are, you can safely choose the best time to visit Skiathos by considering the weather patterns. In a nutshell, it is safe to say that visiting in the low season (November to March) and shoulder season (April, May, October) means easily finding a cheaper rental. However, the summer months of June through to September are the most recommended and excellent months to enjoy one of the best Skiathos holidays of your life. Starting with June as the start of the High Season, it’s also synonymous with the start of the beach season, which consistently features hot and sunny weather with lots of crowds. During this time, ferries and flights run with the greatest frequency and prices are at their peak as tourists arrive in large numbers to enjoy an average temperature of 27°C with lovely warm sea water. July is similarly hot and sunny, and along with the upcoming month of August, July is the busiest month on Skiathos in terms of tourism. For this reason, it is recommended that one be sure to book your stay at last 3 months in advance when visiting in July. Skiathos Weather in August is still hot and sunny, although prone to occasional strong winds. Moving on to September, the hot and sunny weather starts cooling a little, which perhaps makes for the ultimate month to visit the Island. With just the right balance, and the winds having died, hotels are still very busy and can be fully booked months in advance during this peak month. 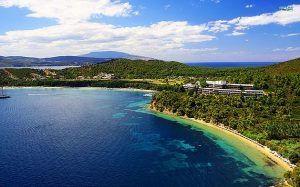 All in all, these before mentioned months (June- September) are undoubtedly the best time for enjoying a summer-loving Skiathos holiday, which serves an abundance of fun-loving activities including swimming and sun tanning. For these reasons and those mentioned, June-September on the island of Skiathos amount to none other than the warmest weather in all the Greek islands. As for swimming in the preceding and succeeding months of May and October, it is often possible but cannot be guaranteed. 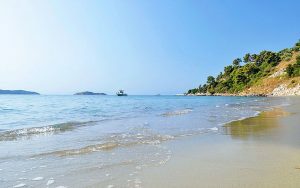 Now if you’re more into sightseeing, wine and food while visiting Skiathos, then you probably don’t need ideal water temperatures. Great opportunities and great views await you during May and October, which may be more meaningful to you. In this case and notwithstanding the splendid summer season, the months of April and May, skipping ahead to October and early November – are definitely fine times too for touring the sights. As for Skiathos weather during these months according to northern European standards- it is still warm. However, seeing that the chances for rain are increased, it might be wise to pack some warm clothing just in case. Starting with April, with an average of 18°C, it’s a great month for hiking, sightseeing, and touring the wineries. Then there are sudden and big differences between early May and late May, during which businesses start opening their doors once more. Skipping from May to October, it is much like May with the exception of the weather moving in the opposite direction. October is a good bet if you want both fair weather and cheap accommodation, however it is known that there are no guarantees. With November, the cool and cloudy days of winter arrive and as result, almost all luxury villas and hotels are closed around the 15th. As for December, it is by far the rainiest month in Skiathos and not recommended for planning Skiathos holidays around. What we are left with is January through March, of which January is damp, cold, and windy with an average maximum temperature of 11°C. During this time, the island is very quiet with few tourists and most restaurants and hotels are closed, with the beach towns being completely shut down. What could be said about February’s weather is that is much like January, apart from the fact that it’s officially coined Skiathos’s coldest month. As for March, a noticeable change occurs in Skathios weather, during which there is less rain, more sun, and warmer temperatures that make for a nice blend of warm and cold weather. By the end of March, most hotels and restaurants are opened on their early way to the high season yet again. A unique luxury villa, located at the beautiful island of Skiathos. Explore our villa or find us on Facebook.